The first evening we went to a lovely Baroque concert in the Schloss Charlottenburg and then to dinner at midnight at the Ständige Vertretung, overlooking the river. 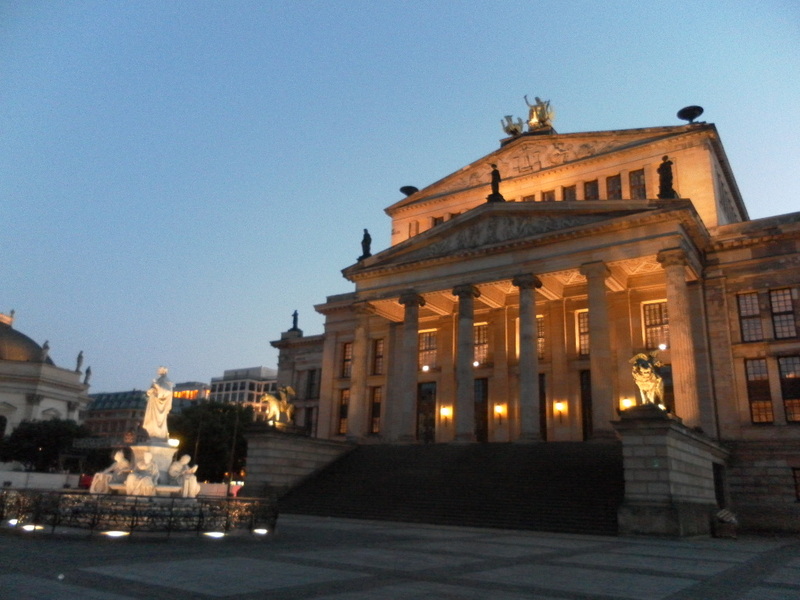 And then the next night we heard an opera concert with two amazing young singers in the building below, and then went out to an Italian restaurant for desert. We were living it up, I tell you. One can hardly imagine how surreal it is, to be walking around at midnight in Berlin, in a fancy dress and shawl, with three professors in evening wear arguing about wine in French, all while partially drunk on the best live singing one has heard all year. It defies reason. 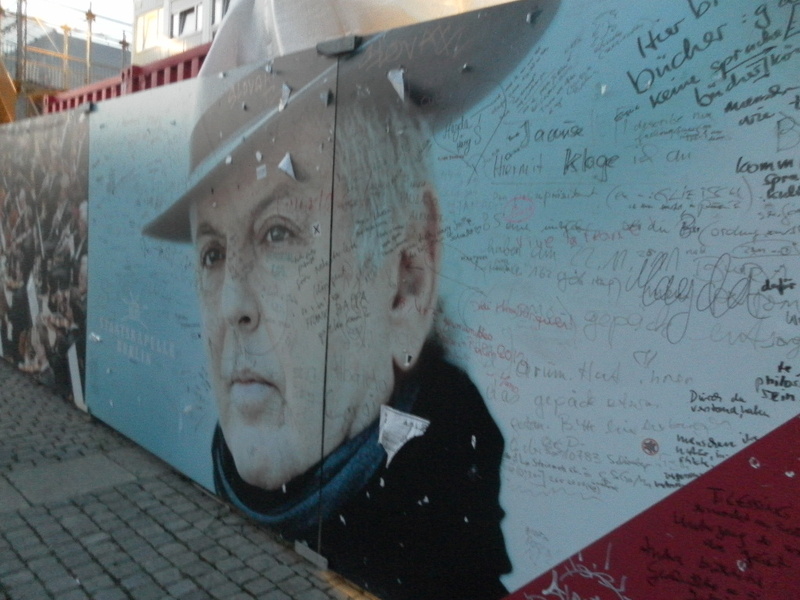 And I couldn’t resist the gigantic poster of a morose Barenboim outside the Berlin Philharmonic. And the museums! A definite highlight for me was the Pergamon, which utterly satisfied the geeky Classics side of things. The museum had full-size recreations of various ancient buildings–awe-inspiring, to say the least. A gate from Babylon, below. As with the churches, I find such things puzzling and astounding. What drove those creators, in this instance thousands of years ago, to devote a life time to make something so beautiful? The last place I visited was another modern art museum, this one an old restored railway station…. The main exhibition was the work of Joseph Beuys, a new one for me. He was one of the most important German artists of the previous century. I would have to spend a good deal more time with his work to make any commentary on it, other than to say that I found it exceedingly enigmatic. But I really liked the work below, dozens of blackboards filled with faint writings (in English!) on philosophy and society and geometry. 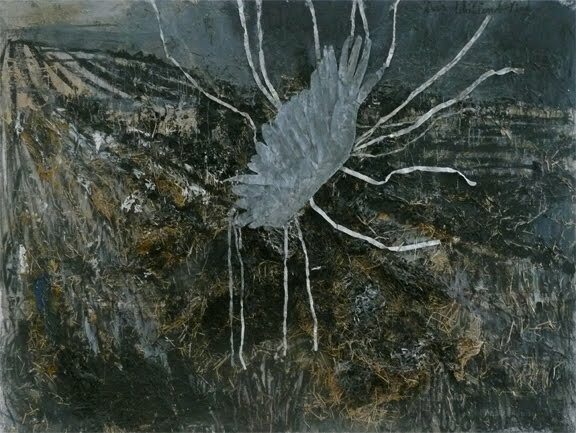 I was mostly interested in Anselm Kiefer, the second artist I had fallen for in the San Francisco MOMA. There was only one small room of his works here, and he was as difficult and as beautiful and as tied to Germany’s history as before. If Cy Twombly is Shakespeare (“What do you read, my lord? Words, words, words…”), Kiefer is Mann’s Doktor Faustus. If you are ever in San Francisco and the exhibition is still there, go and see this one below, with the lead angel wing. This entry was tagged art, Berlin, Classics, literature, modern art, museum, music, opera, Thomas Mann. Bookmark the permalink.